Interesting. Obviously CL&P either has a private forecasting firm that is just plain bad or they were not listening to some of us degreed meteorologists on TV in the state that were forecasting a crippling snowstorm. Friday morning Bob Maxon and I were forecasting up to a foot of snow that was “record-shattering and historic”. 36 hours out it’s not everyday we use words like “record-shattering” and “historic”. In addition we were playing up the “impact” more than the actual amounts. With leaves on the trees and the heavy, wet type of snow expected we knew power outages could be a huge deal. It happened in greater Albany in 1987 and was most certainly on our minds. “A major snowstorm is on the way and will likely be a historic and unprecedented early season snowstorm. All the parameters and models are showing significant snow totals across the state. Obviously the time of year gives me pause. The biggest October storm in the greater Hartford area was only 1.7″ back in 1979. The biggest storm in the entire state was 9.5″ in the town of Norfolk on October 4, 1987. Still, records are made to be broken and I am quite confident that in many areas this will be the biggest October snowstorm in recorded history. The NWS was banging the drum too on Friday. Here are two discussions from Friday morning and Friday afternoon from the NWS in Albany. Notice the use of the word catastrophic! I understand the need to make excuses but this should not have been a surprise. For one of the most anomalous storms of our lifetimes this was exceptionally well predicted 36-48 hours out. The northwestern half of Connecticut will be picking up the pieces for days and even weeks following a spectacular and historic October snowstorm that has not just broken, but shattered, every long-standing weather record. Even with temperatures at or above freezing (in fact in some areas the entire storm occurred at 34 degrees) snow had no problem accumulating in many areas. Snowfall totals exceeded expectations or wound up on the high end of my ranges in many towns because getting snow to accumulate at some marginal temperatures is just remarkable. Instead of starting as rain in the greater Hartford area the storm began as snow around 2 p.m. With an inch of snow the power began to flash by 4 p.m. and by just before 5 p.m. we switched to generator power for the duration of the storm (in fact I’m writing this on generator power, 15 hours later). Remarkable damage occurred after dark and in many areas the full extent of damage won’t be known until later today. What sounded like shotgun blasts through the night was trees snapping in half. The night sky lit up with flashes from both lightning and transformers exploding. The first 6″ of the storm in most towns was a heavy, water-logged paste. The second (or third, in some cases) 6″ was more fluffy. 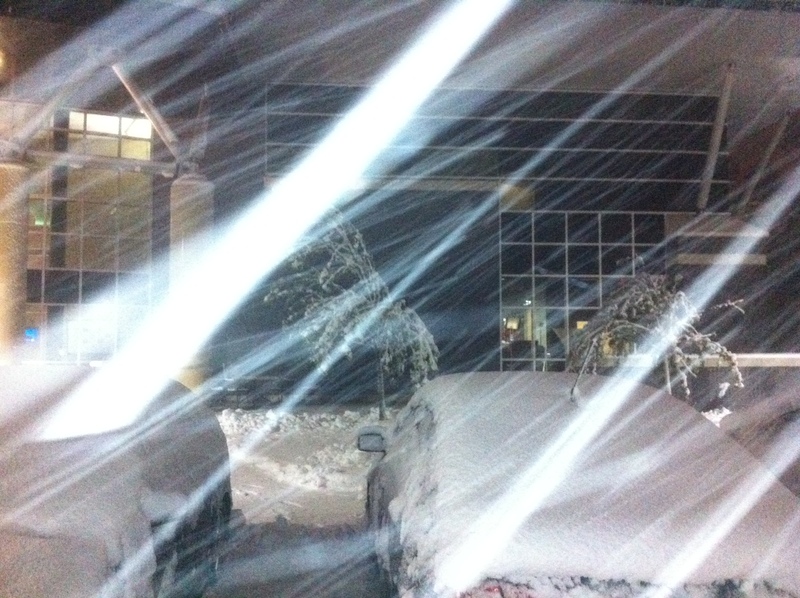 Here’s a look at the front of our building around midnight. Take a look at the poor saplings in the background. 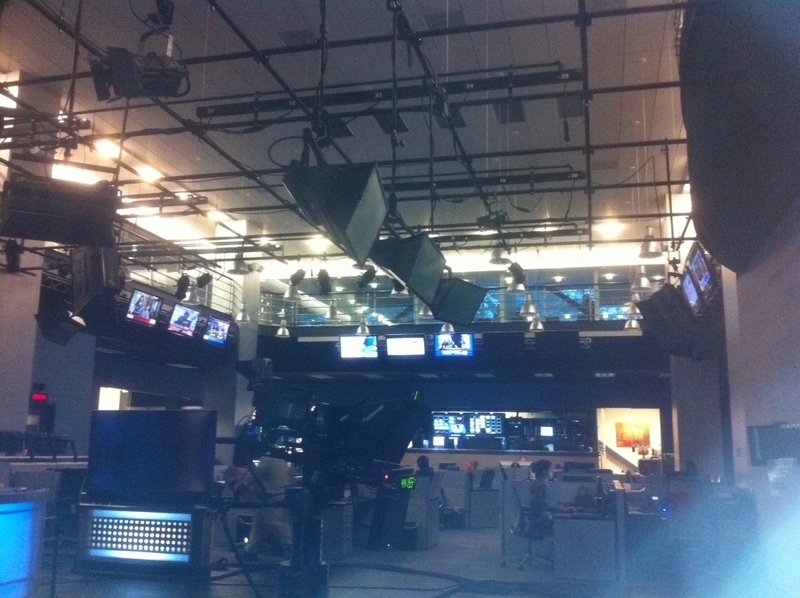 It’s been a marathon here at the station no doubt. 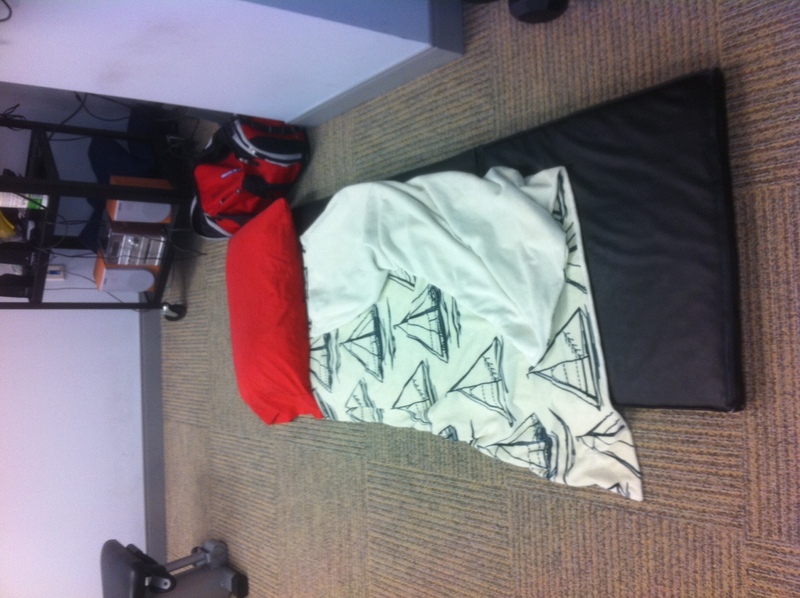 From the morning show on Saturday to coverage all day and night yesterday the NBC Connecticut gym turned into my personal bedroom for the night. The Sailboat Blanket is Soft! @CTLightandPower Unprecedented damage from this storm. Please prepare for worst case scenario – a week or more without power. Call 211 for shelter info. I’m ready for a drink. And a nap. Gradual change to snow in the valleys. 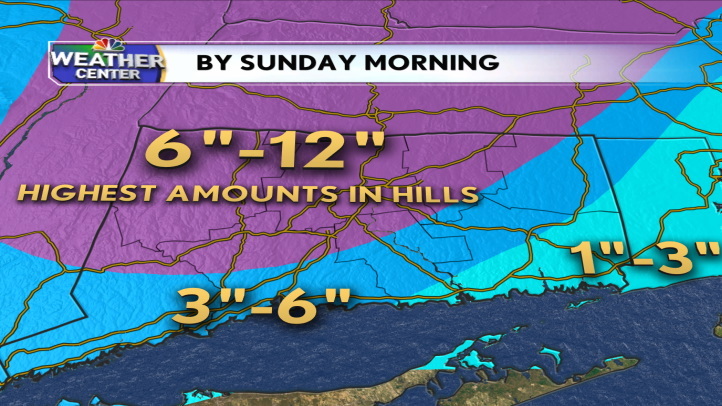 Expect snow in metro Hartford by 5 p.m. and snow in metro New Haven by 8 p.m. Snow tapers off 2 a.m. to 5 a.m. 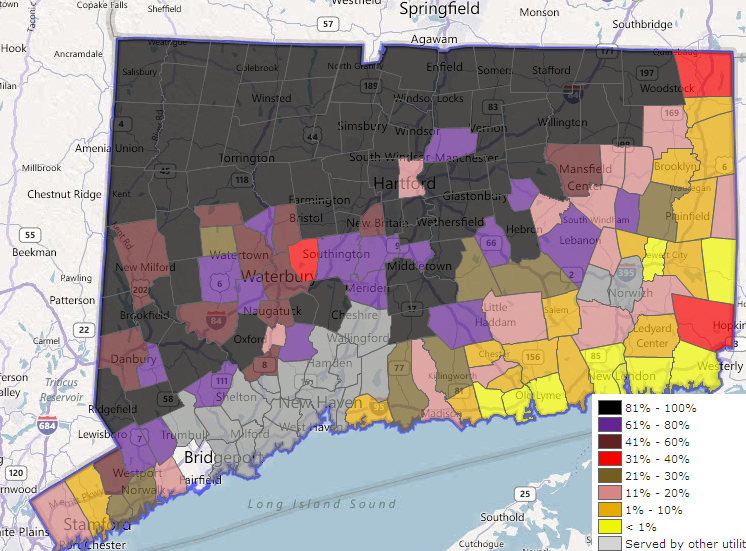 This storm has the potential to produce widespread power outages in some towns. If the higher numbers on this snowfall map verify AND the snow is of the heavy, wet variety we are going to be looking at substantial and very serious tree and power line damage. Note: For a complete climatology of October snows in Connecticut you can check out this link. I’m quite confident that this storm will be a record shattering storm across the state with the potential for significant tree and power line damage. Our call from earlier today still seems valid. It’s possible someone in the hilltowns gets more than a foot but it’s too early to get specific on that. 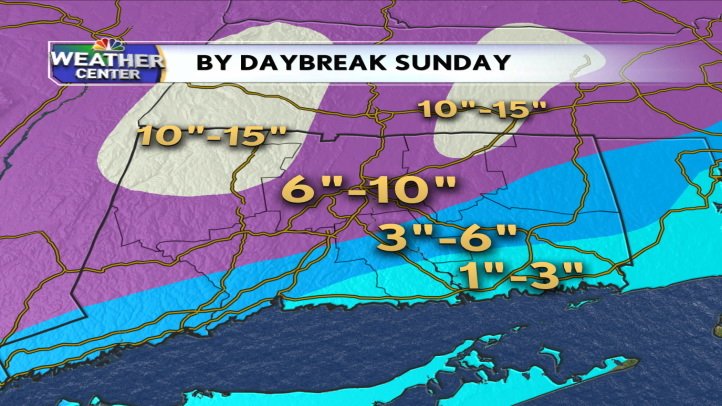 The shoreline forecast is challenging as it’s possible that the cold air will race south fast enough to deliver a substantial snowstorm to metro New Haven. Virtually every computer model has locked into a track south of Connecticut in a “perfect” snow setup. Temperatures in the atmosphere continue to look extraordinarily cold for October. A mix of rain and snow in the midday and early afternoon will change to snow quickly in the hills and a little more slowly in the valleys. When the flip does take place it will be dramatic and snow will pile up quickly. Thundersnow is possible in the heaviest bands. One of the reasons I’m unusually concerned about this storm is that the amount of leaves on the trees make them particularly vulnerable to damage. If the snow is of the heavy and wet variety we could have major and widespread power outages. We’re in uncharted territory here in terms of this type of storm this early in the season. Use whatever adjective (or swear) you’d like to describe this storm. It’s shaping up to be historic, extraordinary, and unprecedented for this early in the season. Be prepared to lose power but just remember that in October and early November the snow will melt relatively quickly! A major snowstorm is on the way and will likely be a historic and unprecedented early season snowstorm. All the parameters and models are showing significant snow totals across the state. It’s possible, but at this point not likely, that the storm will trend west and bring more rain as opposed to snow. It’s something to watch. The big concern for this storm may be damage to trees and powerlines given the amount of trees that are still fully foliated!